Found this reference (see attached image) inn a book entitled James Joyce's Dubliners An Illustrated Edition. Have googled it but not much information found. Anyone familiar with this pen which must date back to 1900 - 1910 I think? Correct me if this is incorrect, but is it possible that this is a quill pen? They sold stationery supplies, writing slopes, and stuff like "vanity boxes" and postal scales. 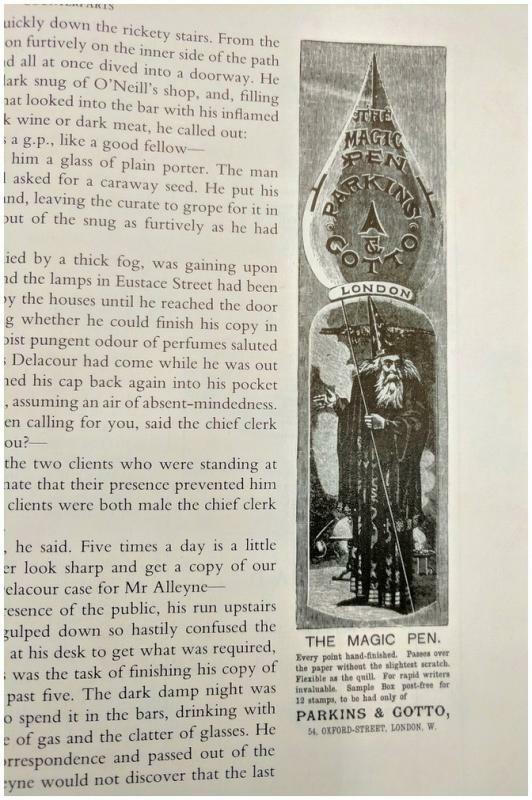 I found a few references to the Magic Pen -- mostly other ads, which seem to be from the 1880s, but which only show the nib. So I'm guessing, like TechWriter did, that they made or sold dip pen nibs as well (the other advertising didn't show the really cool image in the initial post, though). Definitely a dip pen, and probably made by one of the big firms in Birmingham for the London stationer. They made some wild pens back in the day. They needed something to differentiate themselves in a crowded market. We never got that extreme here in the States, at least with crazy shapes or wild embossing. It's not a quill pen, I have several examples, they're shaped just like the tip of a feather quill.